Florida Gov. Charlie Crist has declared a state of emergency in Escambia and Santa Rosa counties due to mounting concerns about an oil spill in the Gulf of Mexico. The order activates the Florida National Guard, imposes price gouging rules, starts the flow of emergency money and waives highway weight limits. The order also allows state and federal agencies to coordinate their response and allows Florida to join the efforts of other states in their emergency response. The Gulf oil spill is several hundred square miles in area, and continues to grow. It is moving in a generally northerly direction, toward the northern Gulf Coast. Some of the oil has already started to come ashore in Louisiana. The governor’s order includes the coastal counties from Escambia to Gulf due to the Deepwater Horizon incident. This story has been updated. Please click here. One person was critically injured when they were ejected in an early Friday morning wreck on Highway 29 in the Gonzalez area. Alfred G. Youtzy, 34, of Milton, was northbound on Highway 29 near Archer Road at 2:15 a.m. when he ran off the paved portion of the road and traveled 209 feet before driving back on the pavement, according to the Florida Highway Patrol. His 1995 Ford pickup rotated and overturned twice before entering the grassy median where it overturned again. The truck came to rest on its wheels in the median, and Youtzy was ejected. He was transported to Sacred Heart Hospital by Escambia County EMS where he was listed in critical condition. A passenger in the vehicle, Joseph Ross, 35, of Pensacola, was transported by private vehicle to Sacred Heart with minor injuries. Careless driving charges are pending against Youtzy, according to the Florida Highway Patrol. Hundreds of local people could be hired to help with oil spill cleanup. Workforce Escarosa will hold hiring events in Century, Pensacola and Milton to screen and recruit applicants for a Texas based firm. Job seekers attending the events must have a proof of U.S. citizenship, a valid driver’s license, proof of any relevant certifications (such as HAZWOPER and TWIC certifications). A Century man was arrested Thursday afternoon after a traffic stop near Byrneville in which authorities said they found materials commonly used to make methamphetamine in his vehicle. Javis Cain Grimes, 25, of Gilmore Road, Century, was charged with driving with a suspended license after deputies stopped his pickup on Highway 4 just east of Byrneville. 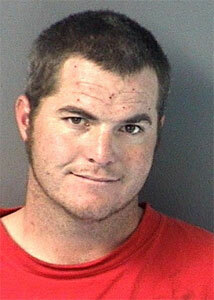 He was released from the Escambia County Jail Thursday night on $500 bond. During a search of Grimes’ pickup truck, Escambia County Sheriff’s Office deputies found pseudoephedrine pills, rubber tubing, starter fluid and other potential meth-making ingredients. Grimes has not been charged in connection with the items removed from the truck; deputies said that investigation is ongoing. 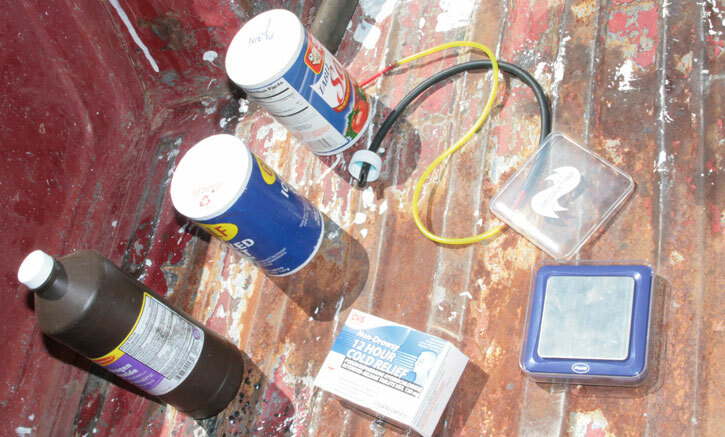 Pictured top: Hydrogen peroxide, salt, pseudoephedrine pills, rubber tubing and a digital scale — some of the potential meth-making materials deputies discovered during a Byrneville traffic stop Thursday afternoon. 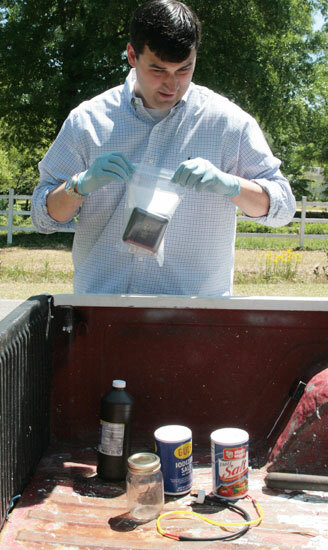 Pictured top inset: Escambia County Sheriff’s Office Narcotics Unit Investigator Heath Jackson bags the items as evidence. Pictured bottom left: Javis Cain Grimes. NorthEscambia.com photos, click to enlarge. Over 1,000 people are expected to take part in the18-hour North Pensacola Relay for Life when it gets underway at 6:00 tonight at Tate High School. There are 35 teams in this year’s event, including: Ann Baroco Center For Women’s Health, Ascend Performance Materials, Cantonment Fire Department, CJ’s Walk By Faith, Comprehensive Pain Medicine, East Brent Baptist Adult 3 Sunday School Class ,Ensley Elementary, ExxonMobil, Gonzalez Methodists, GRROC , Harvesters F. C. U., International Paper, Jim Allen Elementary, Lathram Chapel United Methodist Church, Lipscomb Lions, Longleaf Elementary, Lydia’s Ladies, McArthur Eagles, Molino Park Elementary, Northminster Presbyterian, Pine Forest High School, Pine Meadow Elementary, Ransom Middle School, RBC Bank, Redeemer Lutheran Church , Road Dawgs, St. Luke UMC, Straughn Family, Tate High School, Tate High School Interact Club, Walking For a Cure, and Westgate. 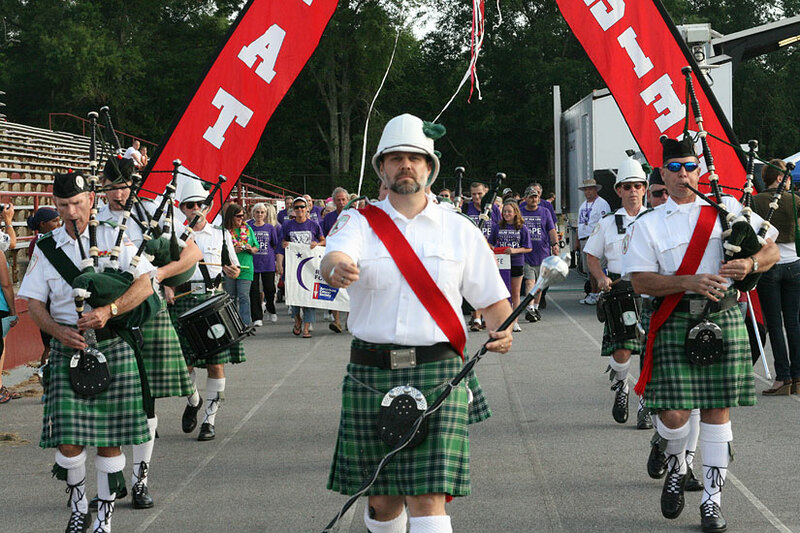 Pictured above: The North Pensacola Relay for Life gets underway last year at Tate High School. NorthEscambia.com file photo, click to enlarge. The Jay Royals defeated the Northview Chiefs 12-2 in six innings Thursday night for the District 1-2A championship in Baker. The winning pitcher for the Royals was Hunter Brown (6-4). He pitched six, allowing eight hits, two errors, one walk and striking out five. Jay hitters included Hunter Boutwell 3-4 with one RBI, Hunger Brown 1-3 with two RBIs, Rush Hendricks 1-2, Tyler Prescott 1-2 with 2 RBIs, Conner Weeks 1-2 with 2 RBIs and Sawyer Gandy 2-3. Northview hitters included Brad Lowery 2-3, Dabney Langhorne 2-3 and Hunter Black with a double. The Chiefs and the Royals were tied for the spot going into the District 1-2A tournament with Jay getting the number one seed on a coin toss. The Royals (15-7) will be at home Tuesday against Panama City’s Bozeman Bucks (19-9) as the Region 2A tournament gets underway, and the Northview Chiefs will be on the road in Bonifay Tuesday against Holmes County (23-5). 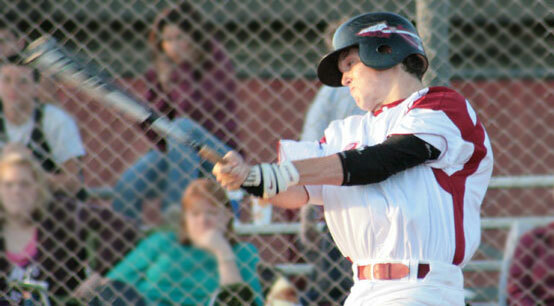 Holmes County beat Bozeman Thursday night 12-8. Today is the final day that applications will be accepted for the position of Century town clerk. Current Century Town Clerk Dorothy Sims is retiring, but will remain available to help train her replacement. The new town clerk will be required to hold at least an associate’s degree with a minimum of three years experience in records management, data processing or experience in municipal government including supervisory experience and any equivalent combination of education and experience. The applicant will also be required to have working knowledge of state statutes and bylaws relating to the duties and responsibilities of the town clerk, local government procedures and office procedure requirements, as well as other office and financial record keeping experience. The advertisement, with complete job qualifications, can be found on our classifieds page. All 2009 real estate and tangible personal property taxes must be paid by 5 p.m. today to prevent being advertised as delinquent, adding advertising costs to the final tax bill. The delinquent ad will be published in the Pensacola News Journal and posted on the tax collector’s web site beginning May 6. Tax payments must be made in person, online at www.escambiataxcollector.com, or on the automated telephone number (800) 601-1055 by 5 p.m. Friday to avoid the additional advertising costs. For more information, contact the tax collector’s office at (850) 438-6500, Ext. 252. The 8th Annual Jay Pro Rodeo will be held tonight and Saturday night — rescheduled by last weekend’s rainy weather. Gates open at 6 p..m. and the rodeo begins at 8 p.m. There will be musical entertainment, plus free moon bounces and activities for the children. Admission is $10 for adults, $5 for children 2-12 and children under 2 are free. All tickets and fliers will still be good for the new date. The Jay Pro Rodeo is sponsored by the Jay Quarterback Club, Jay High SGA, FRIENDS (a community service organization) and the Ted May Arena, located a half mile east of the red light on Highway 4. All proceeds will benefit local youth programs and Relay for Life. Click here and print the flier and receive one free admission for a child 12 and under with each paying adult, compliments of NorthEscambia.com. 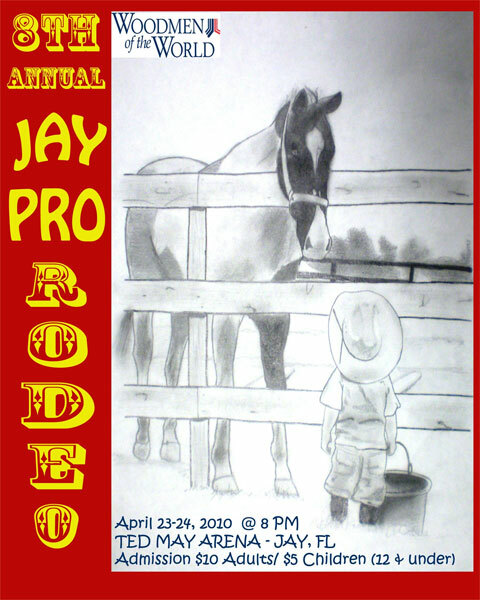 Pictured: The artwork for this year’s Jay Pro Rodeo poster was designed by Jay High School senior Leely Trevino, click to enlarge. Northview High School named their 2010-2011 varsity and junior varsity cheerleading squads on Thursday.